Thanks to smartphones, lots of teachers say this is what their classrooms sound like throughout the day. 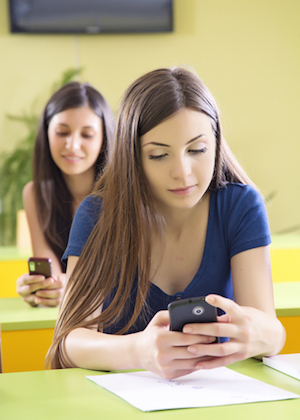 It’s not just teachers who think that kids’ attention is dominated by their mobile devices. Youth workers everywhere seem to wrestle with where to draw the line in the sand during weekly devotions. Millions of parents do, as well, and rightly so. According to a survey from Common Sense Media, a whopping 77% of parents thought their kids were “distracted by their devices and don’t pay attention” on a regular basis. In the same study, almost 80% of kids admitted to checking their phones “hourly,” while 72% of them said they felt pressure to “immediately” respond to texts and/or social media exchanges. No wonder teachers are griping about the tech interruptions. But are smartphone manufacturers on the hook to teach teens how to use (or not use) their devices? Or does that responsibility fall to someone else? Use smartphones to your advantage…without negative side effects. Yes, the devices are meant to connect us, but oftentimes, as we’ve all seen, they just isolate us. The trick is to use your kids’ smartphones is ways that benefit them and your family…while avoiding all the traps along the way. Parents will naturally want to use their kids’ smartphones to communicate with them when separated throughout the day, which is good, but we need to make sure when we’re all under the same roof at night, we’re not then separated by screens. Youth workers can do this in their ministries, too. The Source for Youth Ministry has some great ways youth workers can incorporate kids’ smartphones into their programming (like this idea or this one) to have some fun. Just make sure students know when to pocket their phones so they can focus on the discussion at hand. Establish phone-free zones/times. Yes…it’s possible. Trust me. The dinner table is a great place to set up this boundary (whether at home or in a restaurant). This ensures that family members are interacting with each other instead of staring at a screen during the meal. If applicable, the morning car ride to school might be another place that’s free of tech distractions. Not only will this will allow for clear communication about plans for the day, it might even provide time for an on-the-go Bible study. And of course, phone-free zones should include the classroom if the school administration requests it. Additionally, consider setting aside a time during the week, say, Tuesday nights for example, where all the family members put their smartphones on the charger and hang out together. I have several friends who’ve had their families completely changed by this practice! If you want a little help leveling the playing field, check out 52 Ways to Connect With Your Smartphone Obsessed Kid by Jonathan McKee. He provides tons of fun and meaningful ways you can wrestle kids’ attention off the rectangular devices that so easily dominate kids’ lives. Do whatever you can to get your kids’ attention; your influence on their lives is crucial!